With its self-titled debut that draws upon its Caribbean inspirations, Kansas City Latin Arts Organization Mundo Nouvo has proudly stepped onto the scene with a 2-song single that is free to download. Pueblo Latino: This remake of this Pete "El Conde" Rodriguez showcases a soaring horn section and the nimble voice of Ramon Terrada. ​Mambo Inn: This well-worn Mario Bauza gem is given another spin. The tasty Lawrence Jackson solo accompanied by the groove of Tyree Johnson let's us know that it was worth doing again. To download the album for free, click below. 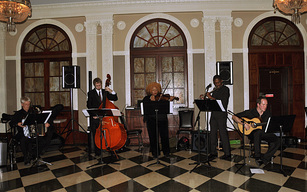 Tango outfit Cucharada stepped into the studio to record their first tracks as a full-fledged quintet. Now, they'd like to pass the savings on to you by offering up these free downloads of 'Quejas de Bandoneon' and 'La Cachila'. These timeless classics have been reinterpreted with the dance crowds in mind. Whether your putting on your dance shoes and putting up your feet, please consider putting this in your music collection today. ​To download the album for free, click below. Soul group Love Bones releases their debut as many of groups that inspired them had: a 2-song single. 'Hearsay' and 'Reap What You Sow' are both culled from the famed Stax records archives and given new life. 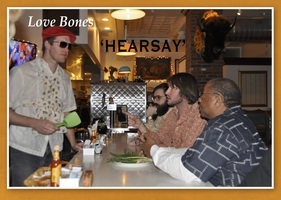 From Jimmy Robinson's soaring vocals to Kyle Stringer's bass foundation, Love Bones has made their arrival on the Kansas City blues and funk scene. An Argentine Tango project that looks to cull repertoire from both the dance and concert halls. Featuring the Piazzolla classic 'Histoire du Tango' adapted for a trio, this debut builds the foundation for the bright future of this ensemble.